TDK has commencing shipping recordable Blu-ray discs. 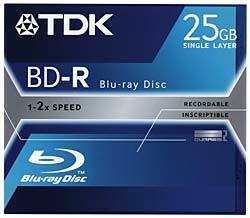 Its initial two offerings are a 25GB BD-R (Blu-ray Disc Recordable) and a 25GB BD-RE (Rewritable - so why not 'RW'?) Australian US prices will be $US19.99 and $US24.99 respectively. Clearly, that's pretty pricey, but who can remember the cost of DVD-R discs when they first appeared? I seem to recall that they were around $AUS15 each. Now, buying a quality brand like TDK on spindles, they cost under a dollar each. Anyway, if you consider that one 25GB BD has more than five times the capacity of a single layer DVD-R, they don't seem so expensive. This release isn't the end of the story. The Blu-ray specification provides for multiple data layers, so later this year TDK will be releasing dual layer 50GB versions of both the recordable and rewritable discs (priced $US47.99 and $US59.99). That's interesting. There are still not rewritable dual layer DVD+/-RWs available, and I suspect there never will be now. The rewritable discs are said to be good for at least 10,000 rewrites and TDK puts the archival life of both kinds at fifty years. The discs are cartridge free, and because the transparent layer on them is only 0.1mm instead of the 0.6mm of DVDs, CDs and HD-DVDs, it has developed a harder surface coating, which it says is 100 times more resistant to scratches than the normal covering. As to higher capacities, the company has developed a quad layer 100GB version and is currently working on an eight layer 200GB one. UPDATE (Tuesday, 11 April 2006, 3:45 pm): Whoops. The media release apparently emanated from the US, so the discs won't be appearing in Australia for a couple of months yet, and as the above is US pricing, they will no doubt cost more in Australian dollars. I've edited the above slightly to correct this. Strikeouts and reds show the changes. 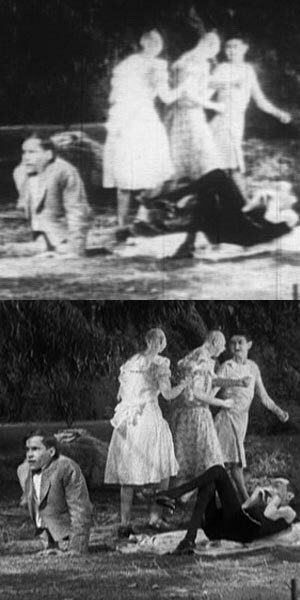 Ages ago I promised to compare two Australian DVDs of Tod Browning's 1932 kinda horror flick Freaks. Well, belatedly, here I go. Of the two DVDs, one is from Siren Visual Entertainment (the top one in the picture to the right) while the other is a remastered version from Warner Bros. There's no need to actually make any remarks on the quality differences. The pictures tell it all. When I was a student in the 70s, the Sydney University Students Union used to run lunchtime screenings of movies weekly. Since students then were even more radical than now, they sought the confronting and subversive. Thus was my first exposure to Tod Browning's Freaks. ... 1932's Freaks marked the beginning of the end of [Browning's] career. The movie was a flop in the US, promptly banned in Britain and, of course, Australia, for its disturbing content, and remained banned until at least the 1960s here. Thus the student showing. How times change. The current DVD carries a PG rating with the semi-explanation 'Mature Themes', which means 'we can't think of anything else to justify denying a G rating'. This is basically a poorly plotted, uninvolving horror story set in a circus (to be fair, some 30 minutes were apparently cut at the studio's insistence). The notoriety derives almost entirely from the actors. A couple of them are 'normal', but the rest are the titular 'freaks'. There's the human skeleton, who looks like he's just emerged from a concentration camp, and several microcephalics (called 'pin heads'), and those of diminished stature, and some without various limbs. Johnny Eck [at the left in the screen shots], who was born with no legs, showed an ability to get around on his hands that would later take him to the top of the Washington Monument. Tod Browning had run away from home when he was 16 to work at a circus, so to him these people were probably familiar. But to see them on the screen shocked delicate middle class sensibilities. Even though the sentiment of the movie is clearly on the 'freaks' side. Or perhaps it was the the romantic interest of the dwarf Fritz (Harry Earles) in the beautiful Cleopatra (Olga Baclanova) who, in the end, is punished rather grotesquely for her exploitation of him. Incidentally, I don't want to appear to be criticising Siren for the quality of its DVD. The fact is, this was available back in February 2004, while the Warner Bros edition didn't appear until late that year. Even if the transfer is dreadful, as this one is, it is far better than not having one at all. Clearly Siren only had access to a degraded film. But at least it wasn't a transfer from an NTSC video tape, as so many cheap DVDs appear to be. And Siren didn't skimp on the transfer, applying an extremely high average bit rate of 7.98Mbps (the Warner Bros version manages with 5.77Mbps). So thank goodness for the likes of Siren and Force Video who make movies available that may otherwise never be seen. Well, I've added ten DVD reviews to my review page: The Simpsons--The Complete First Season (Collector's Edition) , The Sopranos--The Complete First Season, Night of the Living Dead: 30th Anniversay Edition (1988/99), The Texas Chainsaw Massacre: 25th Anniversary Special Edition (1974), Psycho (1960), Psycho (1998), Panic Room (2002), The Interview (1998), Mad Max (1979) and Spider Man (2002). Go here. I was after some independent advise on the best way to go forward on some electronic purchases, and was wondering if you would help. We currently have a 5 year old Sony Trinitron TV, a cheap unreliable Palsonic DVD player and a dying Sony VCR approximately 8years old. We were thinking of upgrading all with the exception of the TV. Another issue is that we live in Cook, basically line of sight to Black Mountain Tower but get bad TV reception ie people walking round the house interfere with the reception. Our initial thought was to get a set top box with a hard drive and buy a new better quality DVD player. Since talking to a few people (sales assistants) they have said just buy a cheap standard definition set top box and add a DVD recorder with hard drive. What would you recommend? Are any brands more reliable/recommended than others on both set top boxes and DVD recorders? I hadn't really considered the alternatives in this way. So, you want to time shift live TV to a more convenient viewing time. Either way would work. You can have a hard disk equipped digital TV receiver (PVR) and record on that, while using a new DVD player for playing back commercial DVDs. OR, you can have a basic digital TV receiver (Set top box: STB) and use a hard disk equipped DVD recorder to both record from this, and play back commercial DVDs. The latter way has the advantage of being cheaper overall, since you can get an excellent hard disk DVD recorder, such as the Pioneer DVR-530H (which is what I use) for a rapidly diminishing price, perhaps under $800 now, and a high quality but inexpensive set top box, such as the excellent Strong SRT-5006, for under $200. Also, no PVRs that I'm aware of use the 'G-Code' ('Showview' in Europe) recording system, whereas several DVD recorders from the likes of Panasonic, Pioneer, Sony, Toshiba and Philips do. Finally, if you decide you want to keep the recording for ever, you can edit out the ads and burn it to a DVD. However, this also has some disadvantages. First, you will have to make sure you leave your STB switched on in advance when you're proposing to timer record. Second, unless your STB has more than one output, you'll have to either swap cables or watch live-time broadcast TV through the DVD recorder. But before doing this, get your TV antenna looked at. Digital TV reception may also suffer if you have problems. Direct line of sight at this quite short range ought to provide very good analogue reception. Get an antenna specialist in.